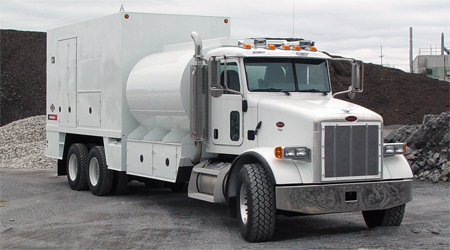 IMT has been building lube trucks for more than 30 years. During that time, they've learned a thing or two about how to make a Lube Truck last in some of the harshest working conditions in the world. Polyethylene (Poly) Tanks: 80% reduction in tank weight versus steel, allowing you to carry more product. Same warranty as steel tanks. Cleaner product because the Poly does not rust. Poly tanks have been in the field since 2007 and can be considered a "proven" product. Enclosed or Open Style options: Enclosed units can include several different heating and insulating options to keep your product flowing even in cold weather.